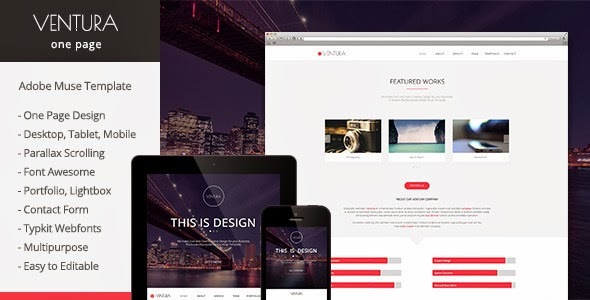 Ventura is a One Page Multipurpose Muse Template. Ventura is a modern and clean Adobe Muse template designed for Corporate, Creative, Agency or Multipurpose. To edit this template with Adobe Muse is very easy! You can change colors, texts or replace the images in a few minutes. Desktop Tablet and Mobile version are included! Item Reviewed: Multipurpose Parallax One Page Muse Template 9 out of 10 based on 10 ratings. 9 user reviews.